We help designers, agencies and business owners test, learn and grow their business online with smart, simple A/B/X testing. From idea to implementation, we help you make smarter decisions. Should we have a bold link at the footer of blog posts? How do we increase form fill outs? Maybe we could add a testimonial next to the contact form? Inside beaver builder, make your changes that would support your idea. Simply tag your experiment and your variations. Easily tag conversions by page view by dragging in a Beaver Builder "Conversion" Module. That's it, now we wait for the results. Easily see the winning experiment variation when enough data has been collected. Be certain that you are making the right move for your business. 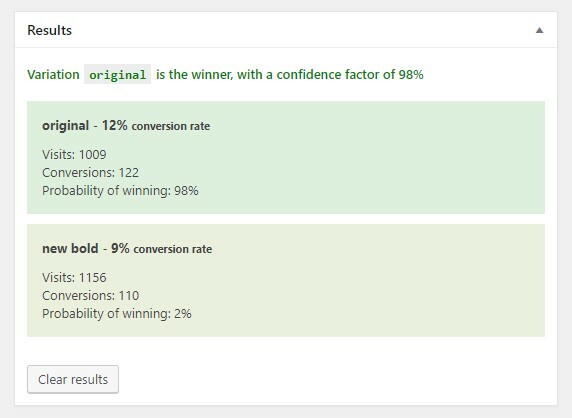 Automatically implement the winning experiment without any intervention (coming soon). This 5-minute video shows you everything you need to know about how this plugin works and what you can expect. Thanks, Nathan! Which package you choose mostly determines how many websites you want to test on. All plans renew annually, with a 30% discount on listed prices. Prices in USD. Canadian customers - tax not included. Need an unlimited plan for your WaaS? That's $549 per year. Sign up here. Do I need to plug this into Google analytics or something? Does this work with Beaver Themer? Does this plugin work with Gutenberg, Elementor, Divi etc? No, well maybe Gutenberg in the future. 30 days, no questions asked. Just log in to your account and request a cancellation. It will be processed within 1 week. Can I easily swap licences between websites? Sure, just deactivate the plugin on the old site, then remove the domain in your Beaver Team account area.